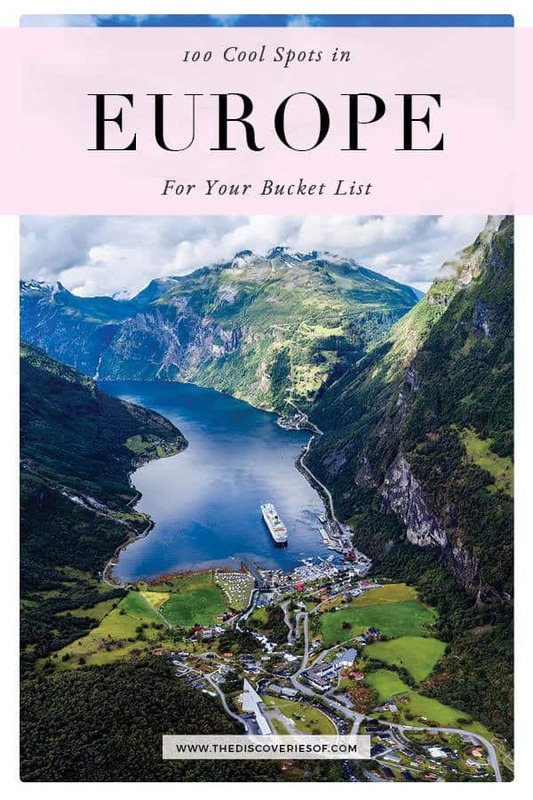 Planning a trip to Europe? We’ve compiled the ultimate Europe bucket list. Your go-to guide to the top 100 things to do, see and eat across the continent. 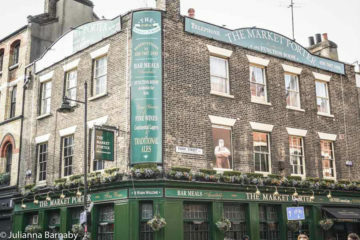 How many have you been to? 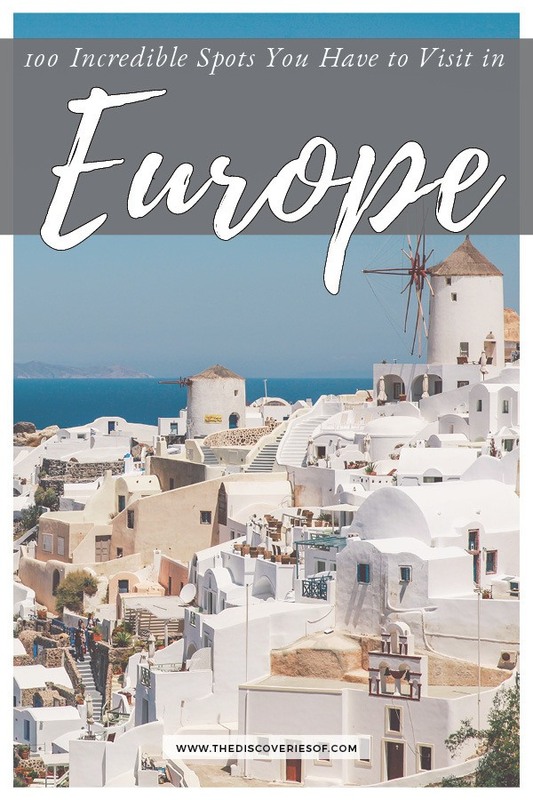 Europe is filled with wonderful travel spots – age-old cities filled with beautiful galleries, stunning landscapes, gorgeous beaches – you name it, it has it. How many of these 100 awesome bucket list destinations in Europe have you seen? Europe boasts a lengthy list of historical landmarks that is unrivalled by any other continent. Whether you’re simply stopping off for a weekend away in sparkly Paris, or are planning a trip darting from country to country across the continent, you’ll want to check out some of these showstopping sights. 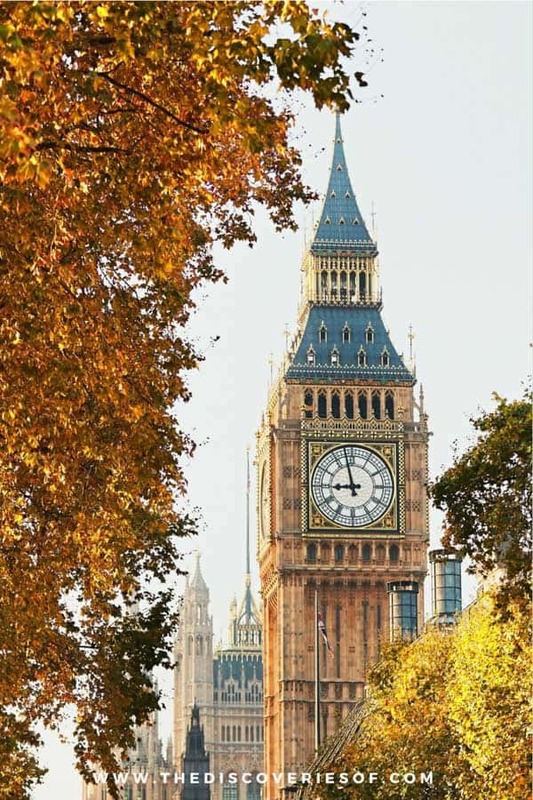 The Elizabeth Tower, more commonly referred to as Big Ben, is one of the most iconic landmarks in London and a must for your London itinerary – it’s one of the best things to see in the United Kingdom. Built in 1858, the copper embellished clock is joined to the Houses of Parliament and is often a hotspot for tourists. Unfortunately, London’s iconic timepiece is undergoing restoration works until 2021, but one of the clock faces will be working and uncovered during the process, and you can still check out the Houses of Parliament. Home of the Queen of England (and many other UK sovereigns since 1837), Buckingham Palace is one of the best spots for your ultimate Europe bucket list. With around seven hundred and seventy-five rooms (nineteen open to the public), this luxurious residence is one of the best things to do in London. Stonehenge, as the best-known prehistoric monument in Europe, is one of our top 100 things to do in Europe. The curious collection of crumbled stones is approximately four thousand and five hundred years old, dating back to the time of our Neolithic ancestors. The Eiffel Tower in Paris, France is another addition to our Europe bucket list. Climbing to around three hundred and twenty four metres, the iron lattice tower was originally built in celebration of the 100th anniversary of the French Revolution. Standing to the right of the River Seine, the Arc de Triomphe is one of the most famous tourist attractions in France. 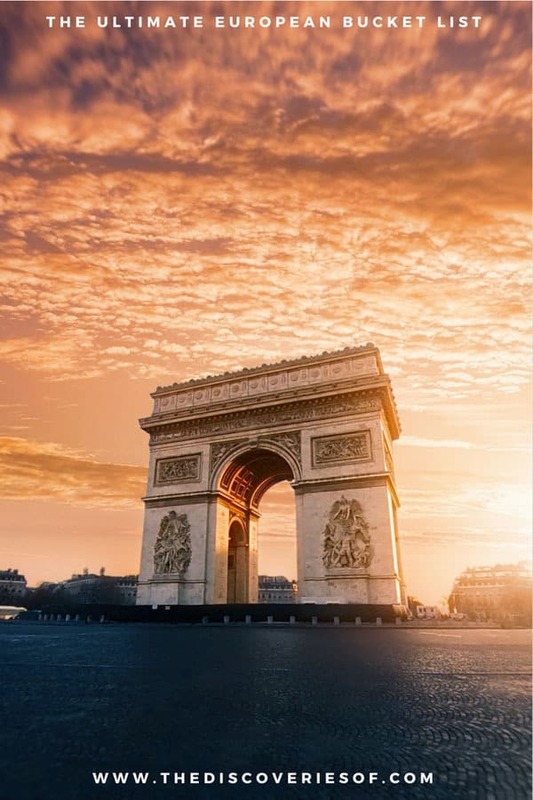 At a height of approximately fifty metres, the Arc de Triomphe was once the tallest triumphal arch in the world and is now one of the top landmarks in Europe honouring those who lost their lives during the Napoleonic Wars. Paris calling? 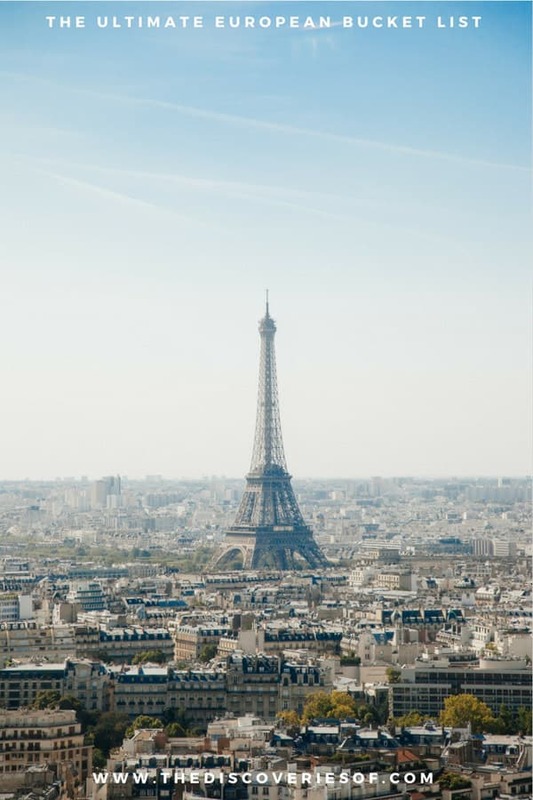 Check out our pick of the best places to stay in Paris. If you’re looking for the best places to visit in Europe, St Peter’s Basilica should be at the top of your list. This beautiful, Italian church is designed entirely in the Renaissance style, making St Peter’s Basilica one piece of 17th century architecture you simply cannot miss on your trip to Rome. Sat in the centre of Rome, the Colosseum dates back to 80 AD. Built from brick and concrete, the amphitheatre once held around eighty thousand spectators who would watch executions, gladiatorial contests, and classic plays. The Trevi Fountain in Rome, Italy is one of the most famous fountains in the world. The Trevi Fountain has made its way onto everyone’s Europe bucket lists for its breathtaking Palazzo Poli backdrop and intricately carved sculptures. Don’t forget to toss a coin in for good luck. The Leaning Tower of Pisa is guaranteed to be on any pick of the 100 things to do in Europe. The slanted bell tower climbs to around sixty metres and took over two hundred years to complete (tilt and all!). Take the obligatory selfie, then spend some time exploring the beautiful Pisa Cathedral next door. Completed in 1434, Florence Cathedral is a stunning piece of Gothic architecture found in Florence, Italy. The Cathedral has earned its place on our Europe bucket list for its history that spans across centuries, and for its large, white embellished brick dome. Visiting the ancient city walls of Dubrovnik in Croatia is a must when travelling around the many landmarks in Europe. The series of stone walls, interrupted by forts and towers were built during the Middle Ages as a way to defend the city of Dubrovnik. Exploring the large structure is one of the top 100 things to do across the continent. The Sagrada Familia is one of the best places to see in Europe. Located in Barcelona, Spain, the unique, Gothic church was originally designed by Antoni Gaudí and is still undergoing work that is predicted to be completed in the next decade. 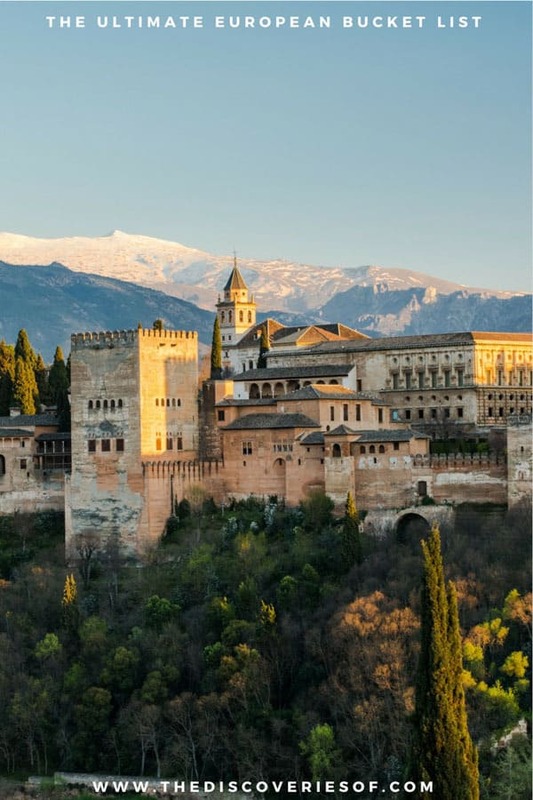 Granada’s gorgeous Alhambra is a red clay palace and fortress complex that dates back to the 9th century. The grand fortress features courtyards, fountains, and towers, stretching to cover around seven hundred and forty metres of land. Book your ticket in advance. Another must-visit landmark on our list of 100 things to add to your Europe bucket list is the Monasterio de San Jerónimo in Lisbon. Built in the Manueline style popular during the age of discoveries, the monastery is a site of both architectural and religious interest and a must-see on your visit to the Portuguese capital. La Grand Place is the central square in Brussels, Belgium. If you’re wondering what to do in Europe, we’d suggest wandering the iconic landmark that is La Grand Place. The square is framed with guildhalls and edifices and is a popular spot with tourists travelling to Belgium. If you’re a lover of quirky architecture, the Cube Houses in Rotterdam in the Netherlands are a must-visit spot. The thirty eight cubes, designed by Piet Blom, are positioned tilted on their sides on top of tall hexagons to represent trees or collectively, a forest. The Berlin Wall, located in the centre of Berlin, Germany, should be firmly on your Europe bucket list. While the Berlin Wall was destroyed in 1989, approximately one mile of the original wall still remains as a memorial of the border that once existed between the historic West Germany and the GDR. One of the most well-known landmarks in Germany is the Brandenburg Gate. Completed during the 18th century, the gate was originally built in celebration of the temporary restoration of order during the Batavian Revolution but is now a symbol of European unity. Looking for that perfect Instagram-worthy destination for your European Bucket list? 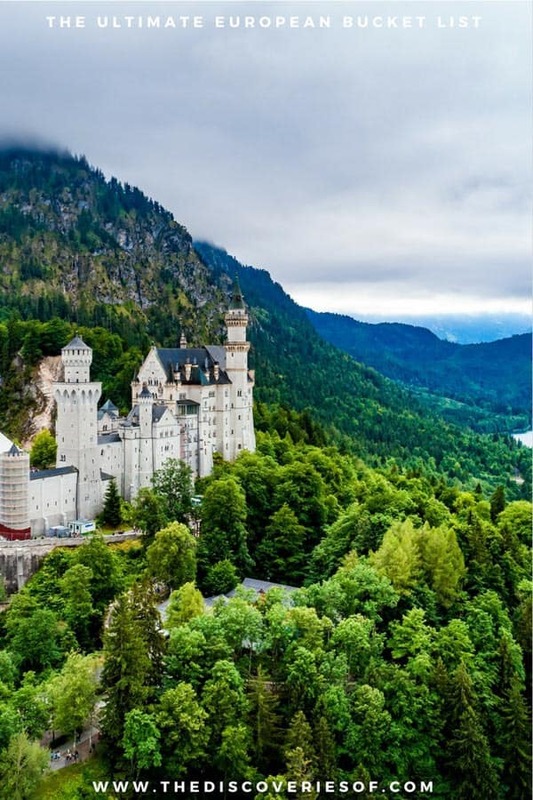 Head to Bavaria in Germany to explore the piece of gothic fabulousness that is Neuschwanstein Castle. The castle, built in the 19th century, was commissioned and paid for by Ludwig II of Bavaria but ended up never being used. The extravagant palace is open to the public and is undoubtedly one of the best places to visit in Europe. Another must-visit landmark is Charles Bridge in Prague, Czech Republic. There’s so much to see in Prague, but the Charles Bride stands apart. The bridge stretches over six hundred metres in length and is covered with stone statues. Wandering this extraordinary piece of Gothic architecture is one of the top 100 things to do in Europe. The Schöbrunn Palace in Vienna, Austria is one of the most iconic monuments in the country. With over one thousand and four hundred rooms, Schönbrunn Palace was once the summer home of Austrian royals and is now considered a place of great architectural and historical interest. Nicknamed Dracula’s Castle, Bran Castle in Romania is one of the more famous places to visit in Europe. The fortress is tied to the bloodsucking Dracula legend and is a national monument. It’s the reason that so many people go to Bran in the first place. What should you expect when you get there? While the castle itself is incredibly beautiful, inside you’ll find a museum displaying art and furniture collected by Queen Maria. The Acropolis of Athens is an ancient city containing several structures of both architectural and historical importance (such as the Parthenon.) 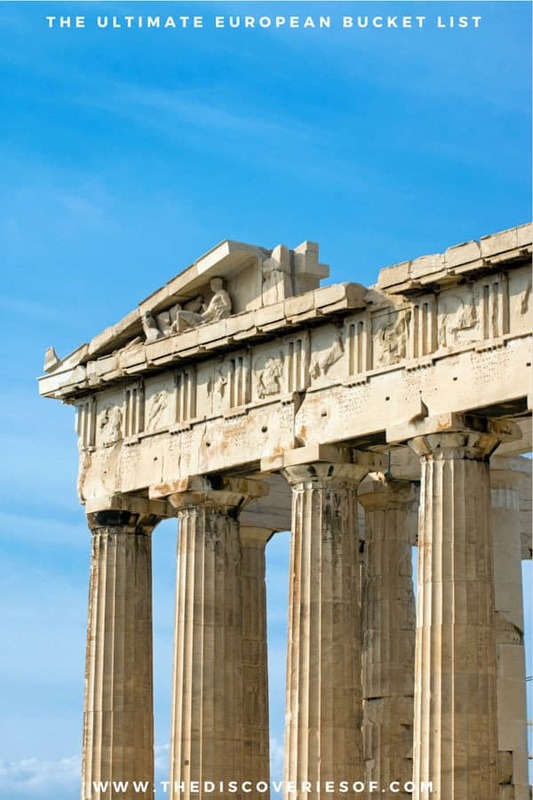 We’d suggest a trip to Athens to explore the Acropolis while travelling around Europe to explore the crumbling ruins. Hagia Sophia, originally built as a church during the 6th century, is one of the best-known attractions in Istanbul, Turkey. Since its construction, Hagia Sophia has been used as a Greek Orthodox Cathedral, a Roman Orthodox Cathedral, an Imperial Mosque and is currently a museum. The final attraction on our landmark section of brilliant places to visit in Europe is the Red Square in Moscow. The Red Square is considered to be the centre of the city and is home to some of the city’s most famous monuments such as Saint Basil’s Cathedral and the Kremlin. Looking for more travel inspiration? 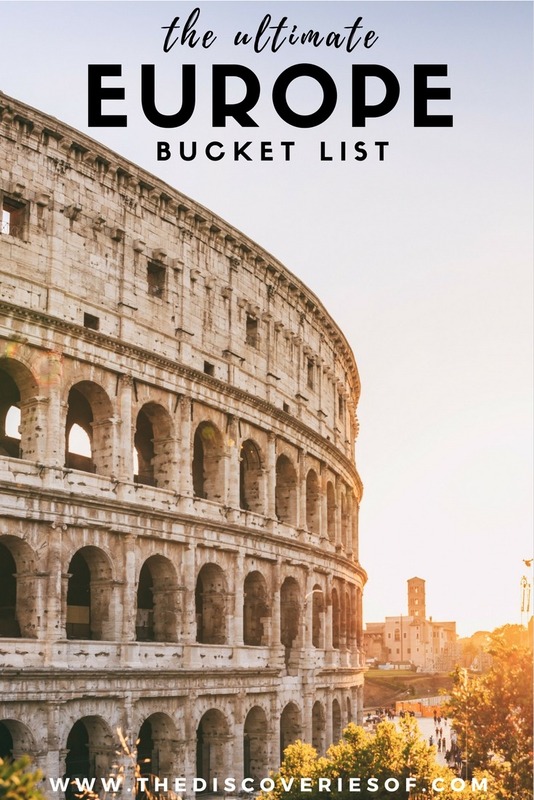 Check out our Ultimate Travel Bucket List. 100 places from around the world to fuel your wanderlust. If you’re wondering where to find the best places to visit in Europe, we’ve got you covered. The following twenty-five additions to your Europe bucket list are all must-see natural wonders that are guaranteed to inspire your wanderlust. Known for its incredible acoustics, Fingal’s Cave on the island of Staffa in Scotland is one of the top 100 things to do in Europe. Exploring the natural arches, caves, and columns is another addition to your Europe bucket list. If you’re wondering where to visit in Europe, we’d recommend taking a trip to Loch Ness in Scotland. Tied with tales of the mysterious Loch Ness Monster, this deep blue lake covers approximately twenty three miles and is one of the must-see natural wonders in Europe. Another natural beauty on our Europe bucket list is Giant’s Causeway in Antrim, Northern Ireland. Here you can wander the thousands of grey, circular, basalt columns and take in the beauty of the jagged stones and frothing sea. Verdon Gorge in south-eastern France is often rated as the most beautiful gorge in Europe. Unsure of what to do in Europe? Take a trip to this green speckled river canyon and take in the beauty that is the turquoise Verdon River. As the tallest sand dune in Europe, we simply could not neglect to mention the Dune of Pilat in the region of Aquitaine in France. The dune stretches to around two point seven kilometres and is five hundred metres wide. Écrins National Park, located along the French Alps, is another of our must-see natural wonders. 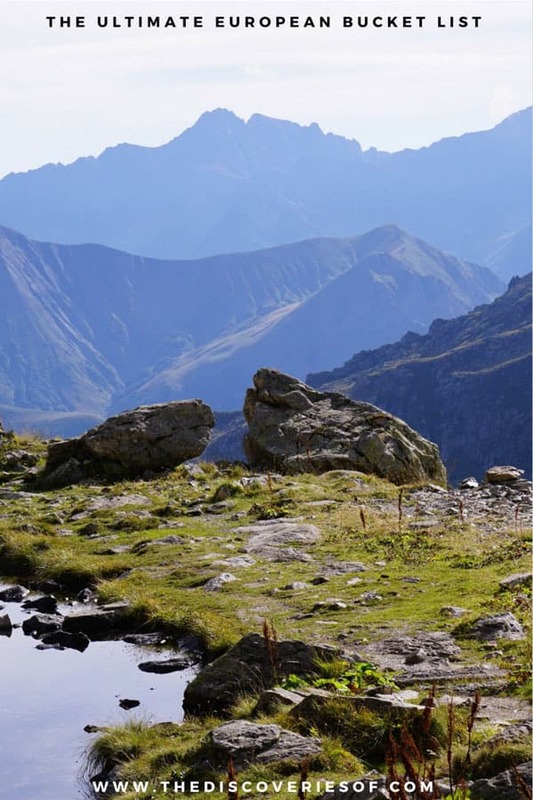 With snow-capped peaks, sloping valleys, thick areas of woodland, and glassy lakes, a hike through Écrins National Park along the Alps is high up on our Europe bucket list. Lake Como is tucked away in the Lombardy region of Italy and is certainly one of the best places to visit in Europe. The lake covers one hundred and forty-six kilometres and is one of the deepest lakes in Europe. Surrounding the lake there are several villas and palaces along with the homes of famous celebrities. Along the coast of the Italian island of Capri you’ll find the Blue Grotto. The Blue Grotto is one of our must-see natural wonders on our list of 100 things to do in Europe for the beautiful sixty metre stretch of cave covering luminous blue seawater. 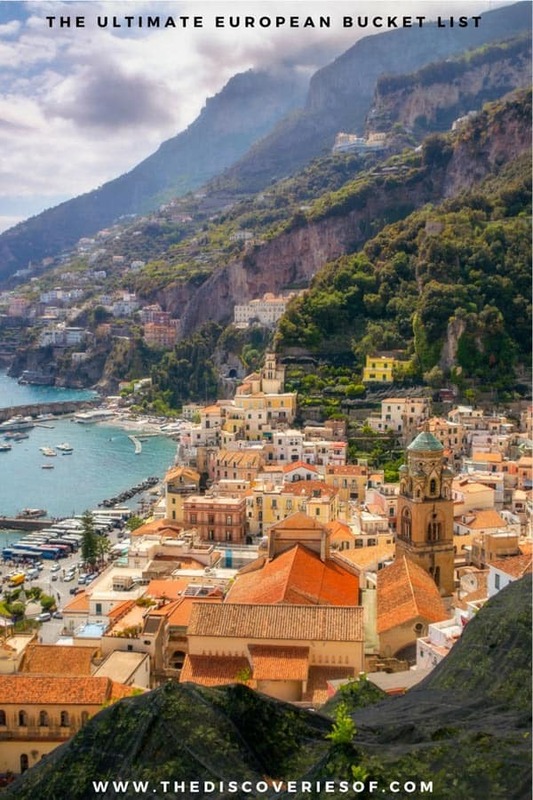 Amalfi Coast, found in southern Italy, is one of the most beautiful places to see in Europe. The coast is composed of several beachfront towns and villages, along with stretches of sandy beaches, green cliffs, and woodlands overlooking the Tyrrhenian Sea. Climbing to around three thousand three hundred and twenty-nine metres, Mount Etna in Sicily is one of the tallest active volcanoes in Europe. Mount Etna is one of our must-see natural wonders for its rugged peaks, criss-cross vineyards, and orchards. The incredible views from the top of Mount Etna are worth the challenging hike. Slicing across the border between Italy and Switzerland, Matterhorn is the pyramid like peak worth noting on your Europe bucket list. Climbing to approximately four thousand and five hundred metres, Matterhorn is one of the tallest peaks along the Alps and in Europe. 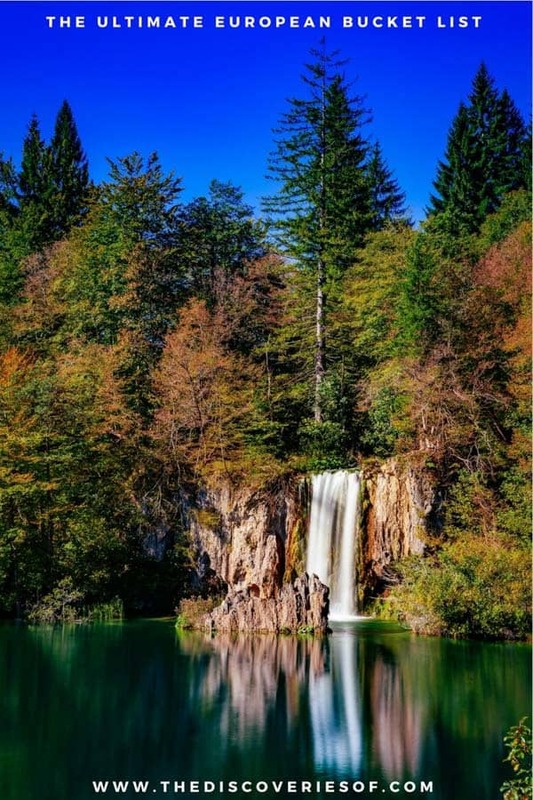 With just under three hundred square kilometres of forests, lakes, mountains, valleys, and waterfalls, near Zagreb, the Plitvice Lakes National Park in Croatia is one of the top 100 things to do in Europe. As one of the oldest national parks in south-east Europe, the park is hiked and trekked by thousands of tourists eager to explore the wildlife. Cabo de Gata-Níjar National Park in the Almería province of Andalucia, Spain is another spot worth adding to your Europe bucket list. The coastal area has a climate similar to hot, dry deserts and features mountain ranges, rock islands, and coral reefs. There are also several towns spotted across the area, along with many species of animals, such as flamingos, that call the Cabo de Gata-Níjar National Park home. Located in the small village of Borrenes, Spain you’ll find Las Médulas gold mines. The mining site is known as one of the most important during the time of the Roman Empire. If you’re wondering where to visit in Spain, we’d suggest you take a trip here to La Médulas. Another German addition to our Europe bucket list is the Black Forest located in southwestern Germany. The Black Forest is covered in thick woodlands (so thick that this is how the forest got its name) and dotted with snow capped peaks such as the Feldberg mountain. A must-see natural wonder that simply cannot be missed while travelling around Europe is the Eisriesenwelt caves located in Werfen, Austria. This natural cave is formed from limestone and ice and, extending over forty two kilometres, is the largest ice cave in the world. 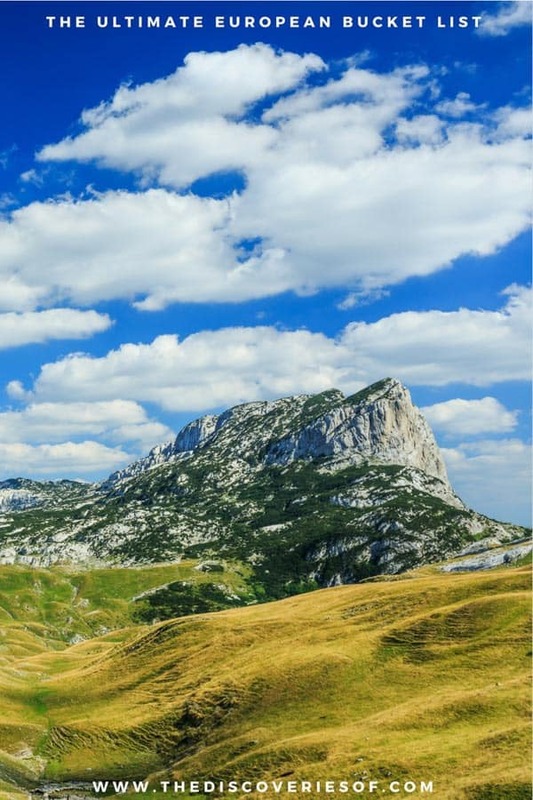 Durmitor National Park, with its glacial lakes, huge peaks, and sloping river canyons, is another of our top 100 things to do in Europe. 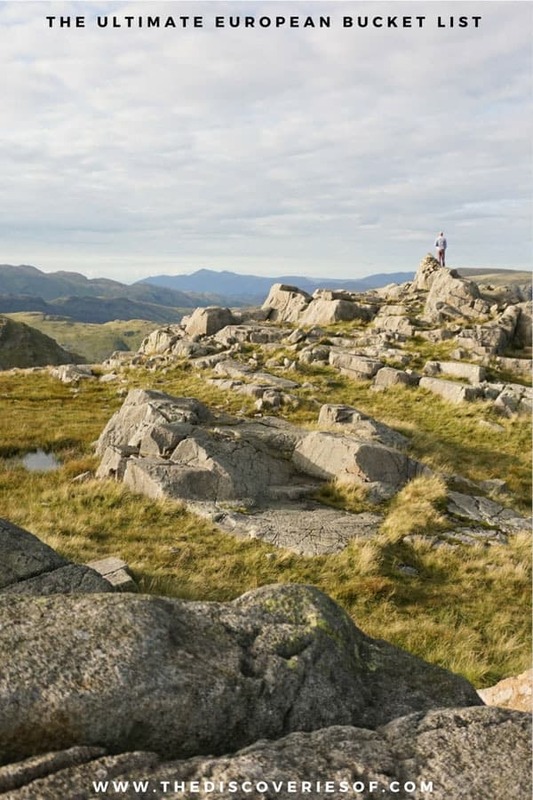 The national park has over forty eight peaks that climb over two thousand metres and is a spot popular with tourists for hiking, skiing, and snowboarding. If you’re wondering where to visit in Greece, look no further than Melissani Cave. This beautiful natural wonder features turquoise waters and is surrounded by forests and mountains. Göreme National Park, found in the Cappadocia region in Turkey, is a worthy addition to our Europe bucket list. With mountains, valleys, and volcanoes, the national park is often referred to as the ‘rock city’ for its stunning, natural rock formations. Covering just over one hundred and fifty square kilometres, Bia∤owieża National Park in eastern Poland is another of our must-see natural wonders. The park is mainly thick, green forest and is known for having the largest population of European bison. 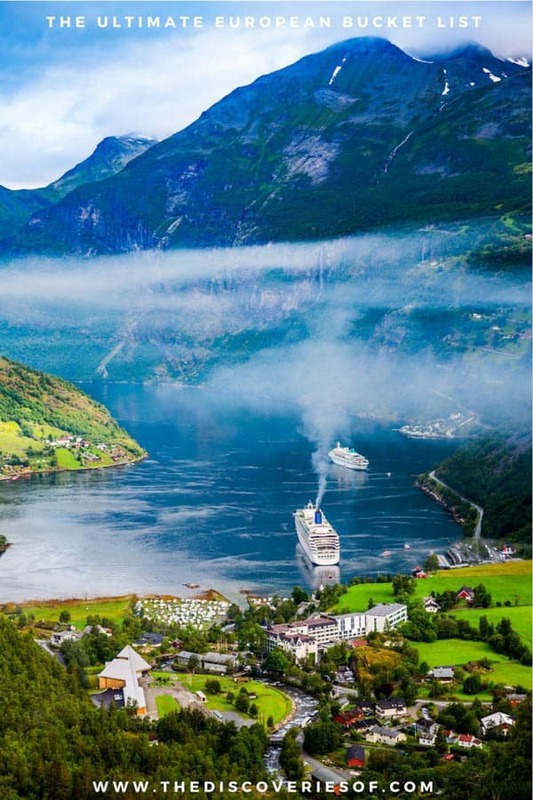 One of the best places to see in Europe is the Fjords in western Norway. Surrounding the many Fjords (lake drains) of Norway you’ll find green speckled mountains and valleys growing fruit such as apples, pears, and strawberries. Another one of the oldest parks in Europe is Sarek National Park in northern Sweden. Within the park there are several peaks that climb to over two thousand metres along with Sweden’s second highest mountain, Sarektjåkkå. Landmannalaugar is one of the top 100 things to do in Europe. The area is covered with natural hot springs and mountain ranges. We’d recommend adding this natural wonder to your Europe bucket list for some truly spectacular sights of snow speckled Iceland. 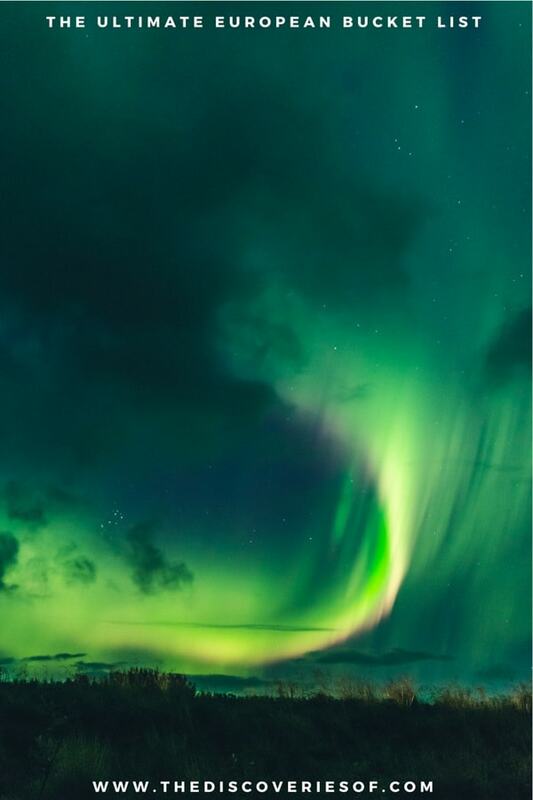 Of course, our list of the must-see natural wonders of Europe wouldn’t be complete without mentioning the Northern Lights. The luminous streaks of blue, green, and purple can be seen from several spots in Europe but we’d recommend Finland, Iceland, or Norway for the best viewings of the lights. From wandering vivid lavender fields in France, to wine tasting in the patchwork Douro Valley in Portugal, there’s no end of must-try experiences to add to your Europe bucket list. The next section of our top 100 things to do in Europe features some of the best ways to pass your time travelling around the continent. While in Europe we’d suggest strolling through the British Museum in London. The museum has over eight million pieces dedicated to human history and is one of the highlights of the capital. 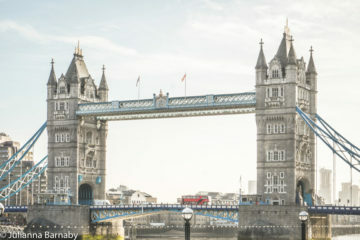 Meandering its way through the British capital, a journey along the Thames is one of the perfect ways to explore London. Hop on a Thames Clipper or take a special tour. A trip in the London Eye is high up on our Europe bucket list. 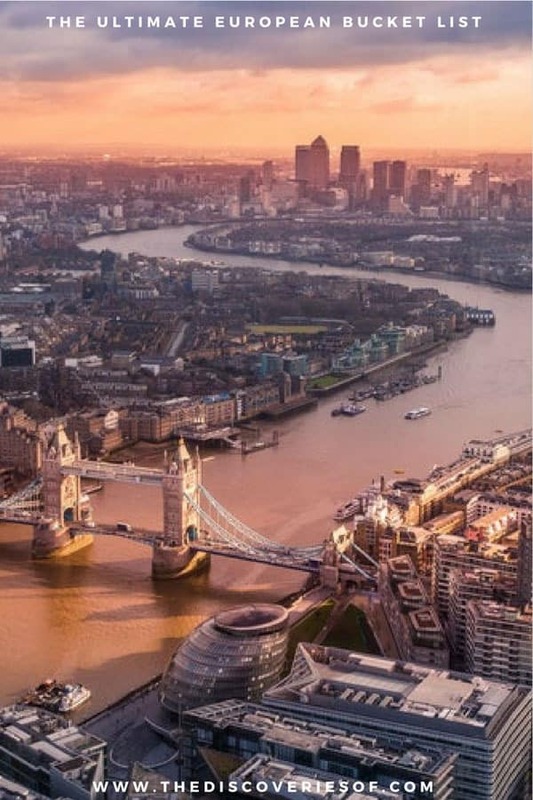 You can ride on Europe’s biggest Ferris wheel, that climbs to one hundred and thirty five metres, and look out over the city of London. Scotland offers a selection of Whisky Tours and Tasting experiences all over the country (time it right and you might even catch a whisky festival like this one in Islay). If you’re after a little history, socialising and Scottish whisky, this experience should be at the top of your Europe bucket list. Another of our top 100 things to do in Europe is go on the world’s fastest zip wire, found in Wales. The zip lines stretch over a mile and riders can zip across a slice of Welsh landscape at around one hundred miles per hour. 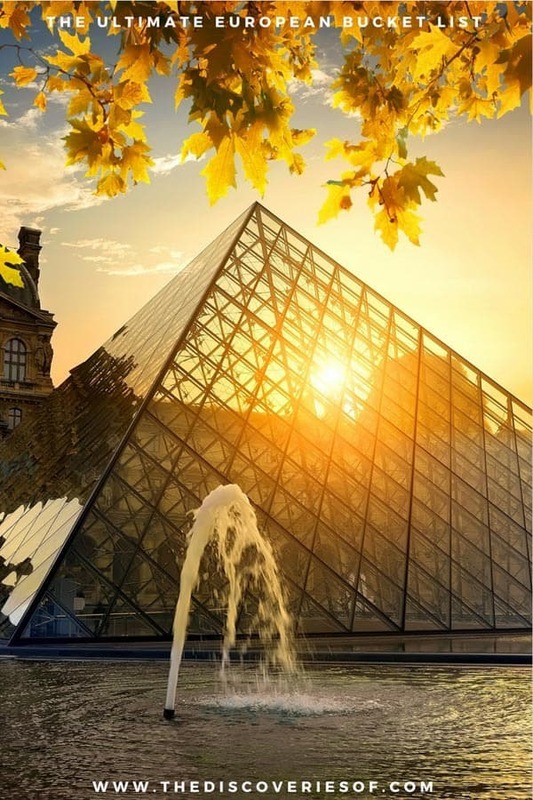 If you’re wondering where to visit in Europe, we’d suggest you take a trip to the Louvre in Paris, France. This museum has the largest collection of artwork in the world (hence why it’s visited by over seven million visitors yearly), and is considered to be a historical landmark in France. While in France one of our top must-try experiences is to wander the lavender fields that surround the Luberon mountains in the region of Sault. These fragrant flowers bloom from June to August and are a spot at the top of everyone’s Europe bucket list. 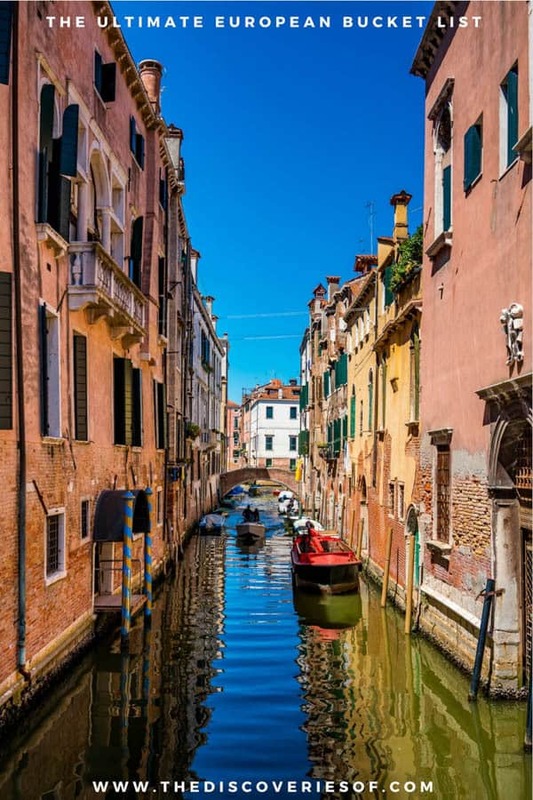 Sailing the winding canals in Venice is one of the top 100 things to do in Europe. Whether you’d prefer to perch in a pointed gondola, or would rather explore the canals by boat, cruise, or kayak, this experience is a must when in Europe. The Museo Nacional del Prado in Madrid, Spain is considered to have one of the world’s finest European art collections. The museum also contains the best collection of Spanish art. A trip to the Museo Nacional del Prado is high up on our Europe bucket list. Another Spanish museum to add to your European bucket list is the Guggenheim in Bilbao. While the gallery is known for its ever changing exhibitions of large-scale, modern art, the Guggenheim building is also considered to be a place of architectural interest. Interested in participating in some European festivals? La Tomatina festival in Buñol, Spain is ideal if you don’t mind a little mess, mayhem, and mass of people throwing squashed tomatoes. Dotted around Barcelona, Spain are several spots ideal for visitors who want to watch some traditional Flamenco dancing. Tablaos (dance floors designed for Flamenco dancers) such as the Tablao Flamenco Cordobes, and the Tablao de Carmen are well worth a visit while in the country. The Douro Valley in Portugal is renowned for its port wines and table wines that can be tasted and toured with several different companies. 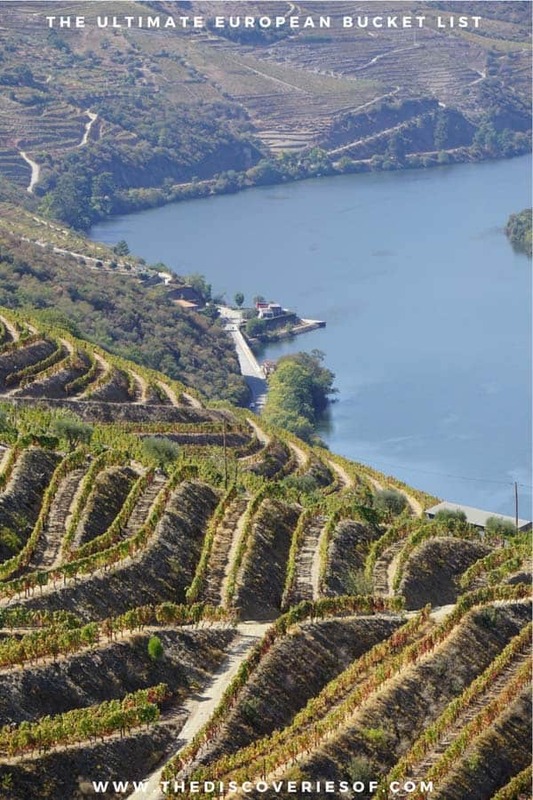 In addition to wandering the criss-crossed vineyards of the valley in search of wine, we’d also suggest taking in the green speckled hillside and River Douro. Constructed of nine spheres each containing exhibit halls and restaurants, the Atomium landmark in Brussels is another addition to our Europe bucket list. Alongside being a museum, Atomium is also a piece of bizarre architecture offering views over Brussels, Belgium. One of the best places to see in Europe is the flower carpet that occurs in August every two years in Brussels. The colourful carpet of over six hundred thousand flowers spreads across the central square in Brussels. Unsure of what to do in Europe? Chocolate tasting in Belgium is always the answer. With Belgium being so well-known for its chocolatey creations, several factories offer tours alongside taste tests that we simply can’t resist. Another festival to add to your Europe bucket list is the Munich beer festival in Germany. 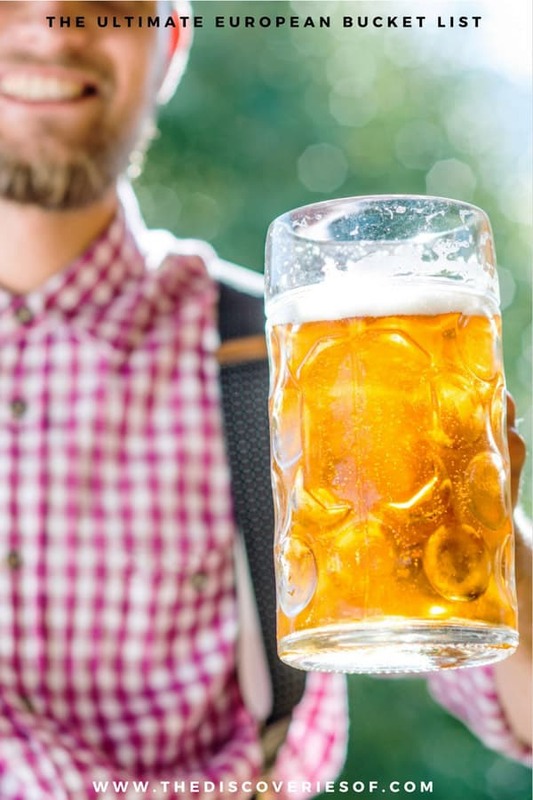 Oktoberfest, as the world’s largest beer festival, lasts around sixteen to eighteen days offering drinks, fairground rides, and music. Kraków Cloth Hall in Poland, centrally located in the main square of Kraków, is one of the top 100 things to do in Europe. While the top floor of the hall offers a display of Polish art and sculptures, the other floors boast stalls selling handicrafts, textiles, and jewellery. If you’re wondering where to visit in Europe, we’d suggest taking a trip to the Van Gogh Museum in Amsterdam, the Netherlands. The gallery offers the largest collection of Van Gogh’s work in the world, displaying hundreds of the artist’s drawings, paintings, and personal letters. The colourful tulip fields are one of Holland’s highlights. 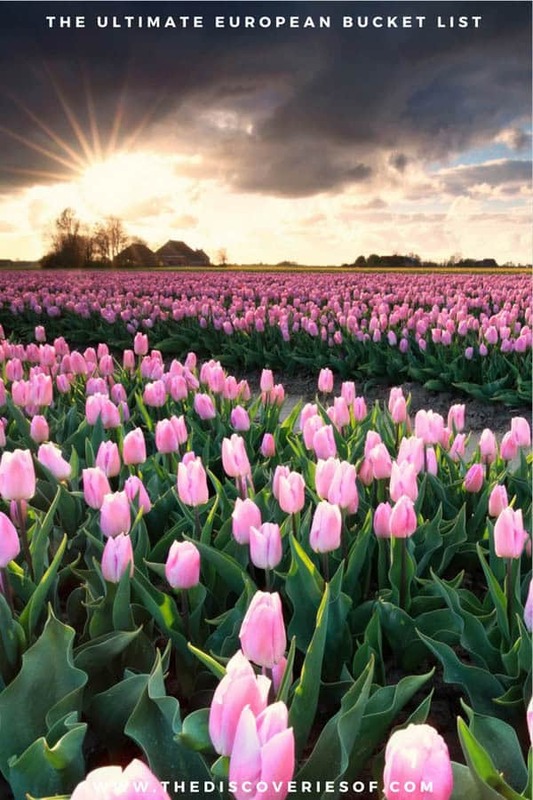 We’d recommend adding wandering the fields of yellow, orange, and red tulips in Keukenhof, Kop van Noord, and other spots around Holland onto your Europe bucket list. The River Danube is the second largest river in Europe, originating in Germany and flowing through ten countries including Austria, Hungary, and Croatia before spilling into the Black Sea. One of our must-try experiences in Europe is to cruise along the river, drinking champagne and snacking on nibbles. Taking a trip to Legoland in Denmark, as the creators of the plastic bricks, is a must when in Europe. The original Legoland park in Billund opened in 1968 and features the original Lego factory. 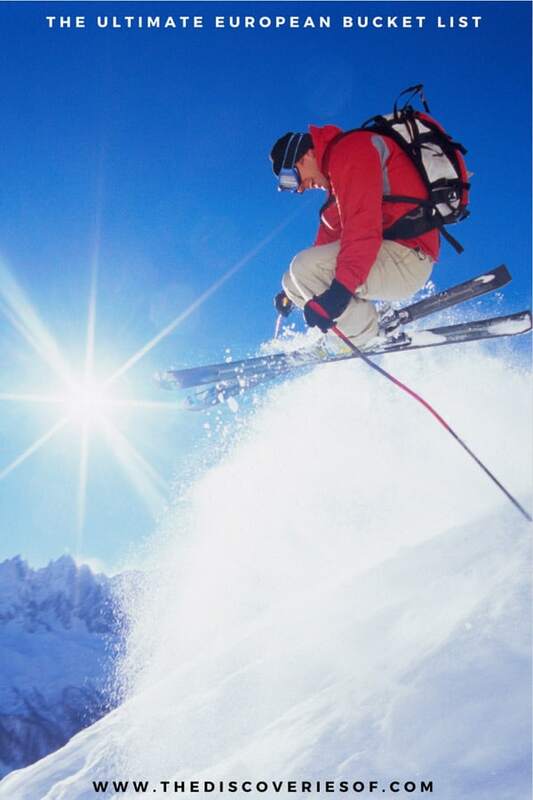 Another experience to add to your Europe bucket list is to go skiing in Norway. The village of Hemsedal is one of the best spots in the country to weave down a section of the Scandinavian mountains. Thinking about what to do for Christmas in Europe? Visit the winter wonderland that is Lapland in Finland for a truly magical experience to Santa’s hometown. Haven’t we all dreamt of a trip on the Orient Express train. There are several different routes you can take on the train such as the usual route from London to Paris to Venice, along with occasional trips to Krakow, Vienna, Budapest, Prague, Rome, Stockholm, and Istanbul. 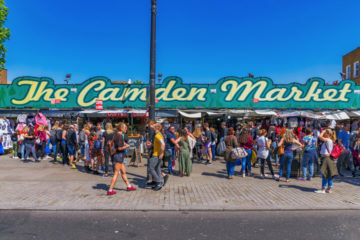 Of course your Europe bucket list wouldn’t be complete without a section on the top traditional food and drink you must-taste while travelling around the continent. From the bubbling Schwarzsauer stew in Germany, to the cheese filled dumplings in Slovakia, this list will leave your stomachs grumbling and mouths drooling for a little European cuisine. 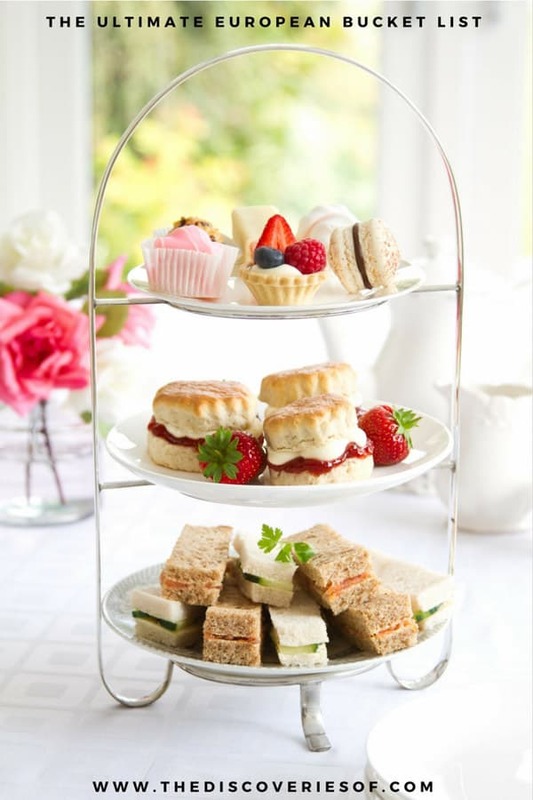 First on our foody section of our Europe bucket list is stopping for a cream tea in England. Sipping a traditional English cuppa while nibbling on scones spread with jam and cream is a must when in Europe. If you’ve already checked tasting a traditional English breakfast off of your bucket list, snacking on a portion of fish and chips while travelling around the beach towns and villages along the coast of England is another of our top 100 things to do in Europe. Fried, battered fish with chunky chips is all the rage in England. Another of our must-taste food and drink while travelling around Europe is to try a little haggis in Scotland (if you’ve got the stomach for it!) Haggis is typically a mixture of minced sheep heart, liver, and lungs with oatmeal, spices, and salt. The traditional Scottish recipe dates back to the early fifteenth century. The Scotts will deep fat fry pretty much anything. From crunchy, battered pizza to deep fried mars bars, you simply have to try the fried food sold in almost every chip shop in Scotland. It may not be haute cuisine, but it’s certainly memorable. Just don’t turn it into a daily habit. GIreland hosts an annual oyster festival in Galway that offers seafood style snacks well worth adding to your Europe bucket list. One of the most popular dishes served at the festival is a mixture of oysters and Guinness beer. One of our top 100 things to do in Europe is to taste a traditional French crêpe. With the choice between a savoury crêpe or sweet crêpe, often served with either cream, chopped fruit, or syrup, tucking into this French treat is a must. Commonly sold at christmas markets or funfairs, ‘lard balls’ are another typical Belgian snack. These smoutebollen are made from deep fat fried pastry and are served with a sprinkling of powdered sugar. Tapas is an appetizer style dish formed from a mixture or hot and cold snacks that is traditionally found in Spain. Almost every Spanish bar will serve tapas (usually during the late afternoon before dinner), with handfuls of cheese, olives, meat, and seafood on offer. Another one of our top 100 things to do in Europe is to taste a traditional, Spanish churro. The fried-dough pastry is often rolled in cinnamon and is served with pots of melted chocolate. Churros can be found in the cafes and chocolate shops speckled around every Spanish city centre. Mayonnaise and chips is a popular pairing in Belgium. If you’re looking for something to eat in Belgium, we’d recommend snacking on a portion of fries served with a selection of sauces found in every chip shop in the country. 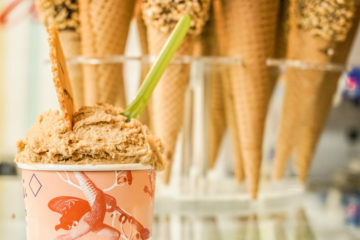 Originating in Italy, gelato is a sweet snack you simply have to try while wandering the busy streets of Italian cities. Devouring a couple of scoops of gelato, flavoured with fruit or nut purees, is one of our must-taste foods to add to your Europe bucket list. Of course, our list of the top 100 things to do in Europe wouldn’t be complete without mentioning tucking into a traditional currywurst sausage in Germany. This fast food snack consists of fried, sliced pork sausages that are seasoned with curry ketchup. Another of our must-taste foods to add to your Europe bucket list is beer soup in Germany. This dish is made from a combination of stale beer, milk, sugar, egg yolks, and cinnamon. While in Croatia we’d suggest trying the traditional black risotto. Served in many restaurants, this dish is named after its black colouring achieved by adding a little squid ink into the recipe. Another foody addition to our European bucket list is Banitsa (a savoury snack typically found in Bulgaria.) Banitsa consists of cheese and whisked eggs between layers of filo pastry. If you’re in the Czech Republic, you simply have to try a pint of Pilsner lager. The pale lager was originally produced in Czech Republic and is a beverage popular with locals and tourists alike. Hungary is well-known for its tasty beef goulash. While travelling all over the country we’d suggest asking for a portion of Hungarian goulash at any restaurant for a taste of traditional European cuisine. Another food that Hungary is well-known for is its strudel. This sweet, layered, pastry dessert is filled with fruit such as apples, apricots, and cherries. Tasting a Hungarian strudel is another addition to our Europe bucket list. Turkey has been producing fruity cubes of Turkish delight since the seventeenth century. 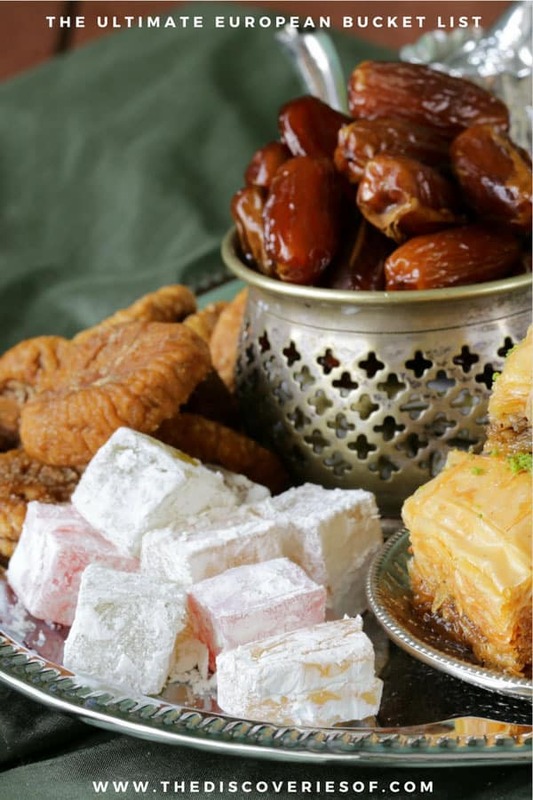 Every sweet shop in Turkey sells boxes of the sugar dusted confectionery (that are traditionally flavoured with rosewater or citrus and filled with chopped dates and nuts) so missing out on tasting a little Turkish delight is not an option while travelling around Europe. You can’t go to Russia and not drink the vodka right?! While Russia offers a huge selection of unique alcoholic beverages (hence having the highest levels of alcohol consumption in the world), Russian vodka is not only a popular drink for locals and tourists visiting the country, but also it’s Russia’s national drink. First made in Gouda in the Netherlands, stroopwafel is a tasty, sweet treat you simply have to try while travelling around Europe. Stroopwafel is made from two thin waffles sandwiched together with caramel syrup. Cyprus is home to so many tasty foods that it’s hard to pick one, but if you haven’t tried handmade halloumi made on the island, you haven’t lived. Tangy and creamy, it’s a real revelation to the tastebuds. Read more in our foodie’s guide to Cyprus. Korvapuusti is Finland’s take on traditional cinnamon rolls. Although the recipe remains fairly similar, the Korvapuusti pastries are shaped completely differently to the typical swirled bun. Every cafe in Finland offers Korvapuusti to dip into a warm cup of coffee. Fried bread is a popular, savoury snack in Lithuania. Whereas the American version of fried bread consists of mainly sugar, in Lithuania the fried bread is dipped in butter and garlic and is sometimes served with cheese. Switzerland is best-known for its warm, cheese fondue served in many bars, cafes, and restaurants. Cheese fondue has made its way onto the must-taste food and drink section of our Europe bucket list for its serving of traditional Swiss cuisine that’s well worth the calories. So, we’ve reached the end of our guide to 100 things to add to your Europe bucket list. With must-visit landmarks, must-see natural wonders, must-try experiences, and must-taste food and drink, we hope you’re feeling inspired to take off and explore. Feeling inspired? Here are 100 things you should know before visiting Europe. How many things have you done on our list of the best things to do and places to visit in Europe? We’d love to hear about your experience in the comments below!